In addition to darkened skies, a new moon (and a full moon) brings Acqua Alta, or to non-Venetians, high tidal waters that under the right conditions can put a large chunk of Venice under water. Fortunately, the flooding today was minor by Acqua Alta standards, with tides topping out around 1.03 meters. 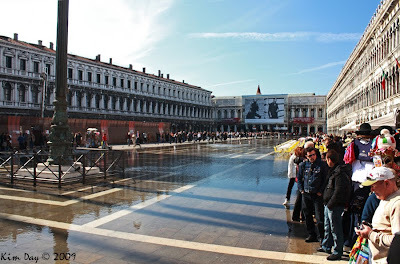 Now, this doesn’t mean that there was 1.03 meters of water in St. Mark’s Square (one of the lowest places in Venice). Only about 3 to 4 inches bubbled up through the drains at its peak. But, it was enough to get the footbridges out so the tourists could still get into St. Mark’s Basilica and keep their feet mostly dry as they wandered through the square in front. In other higher places in Venice, the water merely lapped at the top of the canal banks and made it hard to pass under some bridges. 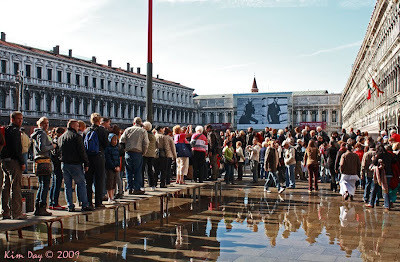 The first picture below shows what St. Mark’s Square looks like at low tide, packed full of people. The next picture below shows what the Square looks like as the tide is starting to come in around 9 am. The final picture shows the square at the peak of high tide (incidently one of the few times during the day when you can get a clear shot the length of the square). The seagulls were out swimming on the square in places. This entry was posted on Sunday, October 18th, 2009 at 5:14 PM. 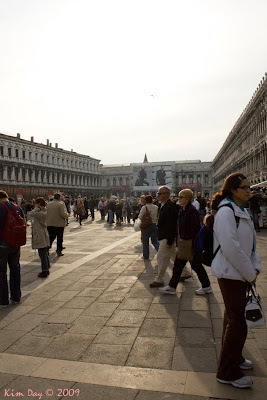 It is filed under Italy, Venice and tagged with Acqua Alta, St. Mark's Square, Venice. You can follow any responses to this entry through the RSS 2.0 feed.